As I've stated numerous times before, I am a pastor's daughter so whenever a book examines the role of the family of the pastor or even the life of a pastor, I am both interested and cautious. So I was interested in this portrayal of a pastor's wife. Maura left Nick 6 years ago when she realized he was giving the church and not her his wholehearted devotion. But when a member of the congregations passes away and leaves a will stating that Maura will inherit the town's old theater if she lives with Nick for six months and allows one church production to take place in the theater. She quickly agrees despite the awkward arrangement. Can Nick and Maura find healing and learn how to live around one another's schedules and differences? Will Maura rediscover her faith in God? 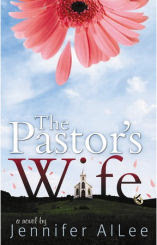 I enjoyed The Pastor's Wife, I thought it was a fun and easy read. It does tackle some serious issues and touches on some serious insecurities that a pastor's wife faces, but for the most part it's a fairly predictable and enjoyable read. This is definitely Christian fiction and so much of it takes place in church culture. Personally, Nick did get on my nerves a little bit, but I was glad that both Maura and Nick had the chance to talk out their expectations for their jobs and their relationship.